Welcome to Dove Cottage on the New River - Enjoy the level yard space with easy access into the River! Fully Equipped Kitchen with Full Size Refrigerator, Dishwasher, Electric Stove, Microwave and Toaster Oven. Stocked with all the cooking and eating essentials. Cozy living room with vaulted ceiling and lots of windows to enjoy the river view. Lots of new, comfy furnishings. Flat Screen TV and Gas Firestove. Dining nook with a view. Master bedroom with Queen Size Bed and private master bathroom with walk in shower. 2nd bedroom with Queen Size Bed. Covered front porch picnic area. Covered front porch lounging area. -	Everything on one level - no stairs! Many rentals give you either New River access or a lovely mountain view, but Dove Cottage gives you BOTH! If you're traveling as a couple, a small family or a pair of friends (or couple friends) this is the perfect way to get the most out of your mountain vacation, for an affordable price. Yes, this lovely cottage sits directly on 200 feet of riverfront, on a flat, grassy lot with a stunning view of the river in both directions, and the mountains beyond. Your own private access to the river is just steps from your front door, inviting you to experience both relaxation and adventure as you dive into unforgettable days of swimming, fishing, kayaking, canoeing and tubing. The nearby Riverside Outfitters can get you hooked up with all the equipment you need. 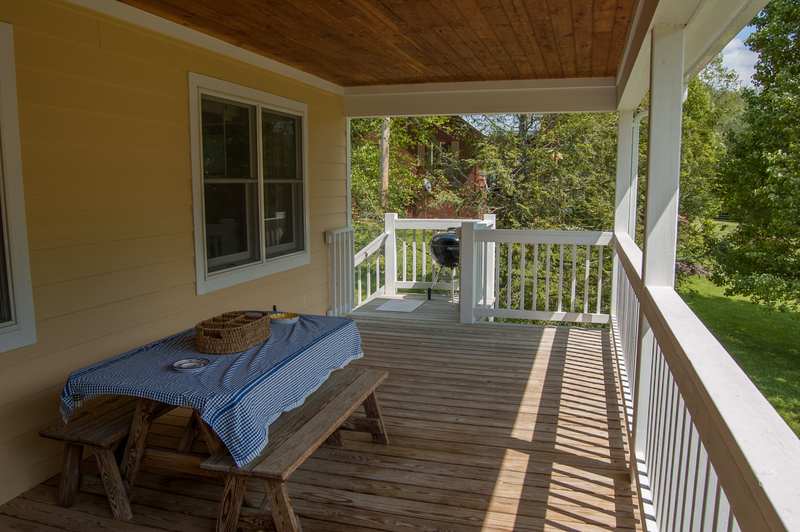 Enjoy the view and the serenity from your spacious covered porch, equipped with comfortable patio furniture as well as a charcoal grill and picnic table for dining al fresco. When darkness falls, take your bag of marshmallows and enjoy a campfire by the river, with nothing to disturb you but some tree frogs, crickets, and a dome of stars above. The interior of this charming home features an open floor plan with wood floors and vaulted ceilings, all on one level, so no one has to drag luggage upstairs. You'll feel energized every morning as you awake to sun streaming in the many windows facing the New River. 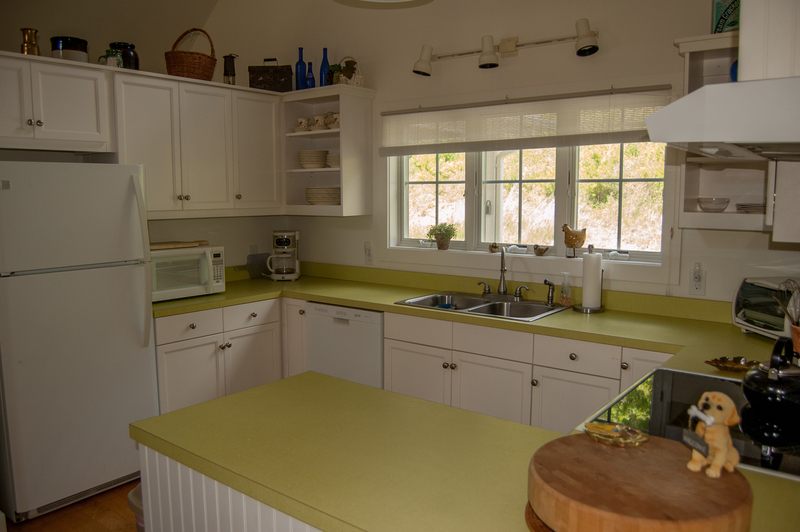 The well-equipped kitchen offers all the amenities of home with a flat-panel electric stove, full-size dishwasher, microwave, coffee maker and of course a full complement of dining accessories. Stay at home for the evening and avoid the drive and extra expense associated with eating out. After dinner get the group together in the great room around gas stove fireplace and the 46-inch flat screen TV with satellite access and a DVD player. When you're ready for bed you'll find a master bedroom with a queen bed, luxury linens, custom-built cabinets and a lovely window seat with beautiful river views. The en-suite master bath has a stand up shower. 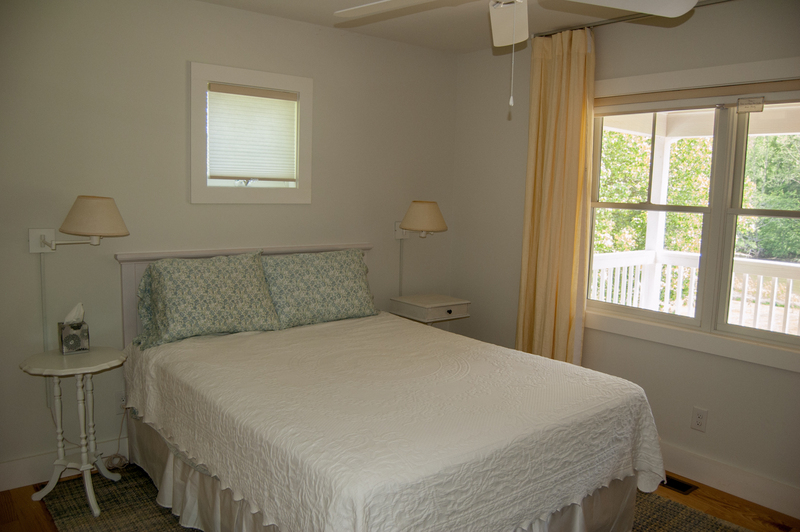 The guest bedroom offers a queen bed, luxury linens and more river views out the back window. An additional full bath featuring a tub/shower combination is off the hallway. Right next to the bathroom is the laundry room, conveniently equipping you with a front-loading HE washer and dryer. This home is in a wonderful central location, close to West Jefferson, Glendale Springs and Shatley Springs, and only 30 minutes from Boone. Enjoy the luxury of your own river cottage today! 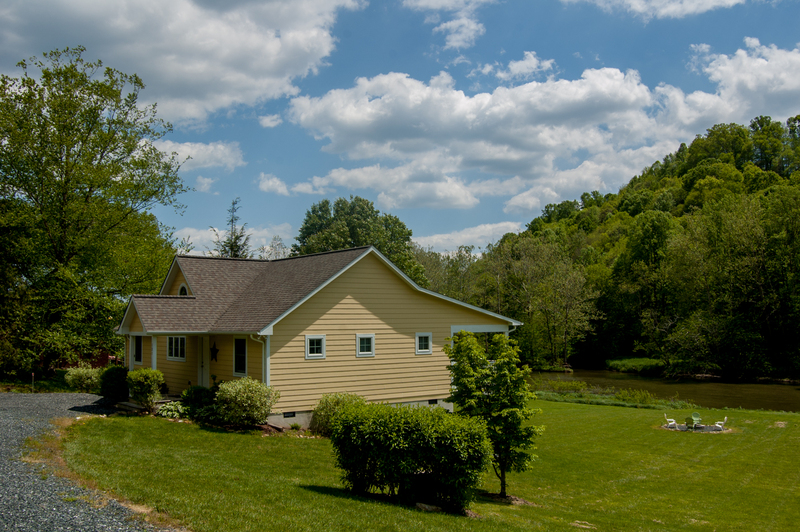 Dove Cottage is situated a few miles north of West Jefferson and Shatley Springs, near the New River State Park and several river adventure outfitters. Wherever you go in Blue Ridge Country, you'll find gorgeous scenery at every turn. Our numerous hiking, biking and horseback riding trails provide some healthy endorphins and unlimited photo ops. In the winter enjoy skiing, snowboarding, snow tubing or ice skating at one of the many area resorts. There's something for everyone! For small-town Americana at its finest, don't miss West Jefferson's historic downtown, with its wide assortment of restaurants, shopping, antique stores, art galleries and wine tasting. As you explore the rest of the High Country, visit Boone and Blowing Rock, for an even wider assortment of dining, entertainment and shopping options. Tour ASU campus, find live music and free concerts, or bring home a treasure from an arts and crafts fair. Of course, you have the perfect setting for just staying close to "home," with the New River at your doorstep, and a big porch that's calling your name! "We enjoyed the visit and the music festival which was the reason for the trip. The house is very comfortable and has everything you would need." "Really enjoyed our stay at this lovely home and the place was very clean and well taken care of., we had everything we needed to sleep and eat. The property is located in a well place and easy to get to. I would recommend this property to anyone, the only thing I disagree with is the 61.00 Home Away fee plus the extra 80.00 for cleaning. 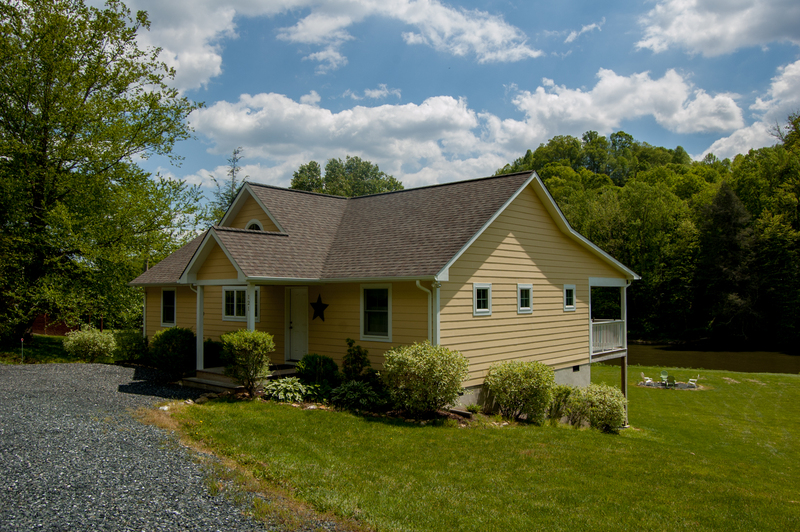 Would love to just rent from now on from Ashe County rental." "Perfect weekend, beautiful home, very clean, enjoyed the fire pit and grill. We hiked and kayaked the New River. My husband needed a grab bar in the shower. He thought the bed needed to be flipped. His side was kind sloping to the outside. It was a bit of a drive to get to the parkway but we had a great visit." "Once again we had a brilliant week at Dove Cottage II on the New River. The house is always spotless, the setting is blissfully quiet and beautiful, and yet it's easy to get into town. Everybody at Ashe High Country is always happy and helpful and I can definitely recommend it (as long as you don't want to book when I do - lol!). My one and only slight grumble is I couldn't find a paring knife or a pyrex-type covered casserole - but then I cook even on vacation! When you don't feel like it, check out the wings and burgers at When Pigs Fly, 658 S Main in West Jefferson. Great food and lots of choices." "We really enjoyed staying at Dove Cottage 11 she's a beautiful home these pictures don't do it justice.The kitchen has everything you will need to cook just bring the food and you will have all you need. The living room and the deck have great views. This house will be great for two couples or a small family.The beds are comfortable and bathrooms are really nice it has washer and dryer. The house is spotless.The river is so nice and the neighborhood is quiet just a short drive to W. Jefferson only about 45 min to Boone. I hope to return real soon.Loved staying"
"Will plan on next year!" 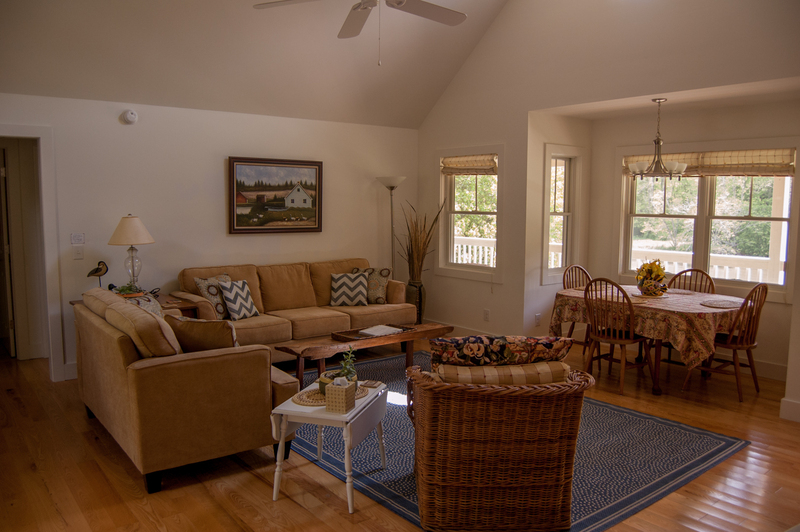 "The Dove Cottage was an excellent place to stay for our weekend getaway. Very well kept and clean. The only downfall is if you plan to play in the river there isnt a good place to get in at the cottage. " "Happy overall with the vacation rental. would have been nice to have the yard freshly mowed before we arrived on Saturday.The inside was very well put together and loved the entire home. Back porch with gate so our furbaby could run loose a bit was very nice. " Thank you for the feedback and we do apologize about the yard, unfortunately it rained almost every day the week before your arrival so time was more limited in getting that addressed. We're please to hear that overall you were happy with the vacation rental and look forward to hosting you again soon. Wad beautiful house was awesome would go again "
"We had an awesome weekend! Such a beautiful location we will definitely want to come back in the summer!" "A beautiful, peaceful property- exceptionally clean, comfortable and well decorated. Plenty of linens and kitchen equipment along with grilling and fire pit supplies. Is a perfect spot on the New River for spring, summer or fall. Close to West Jefferson, Blue Ridge Parkway and other area of interest. 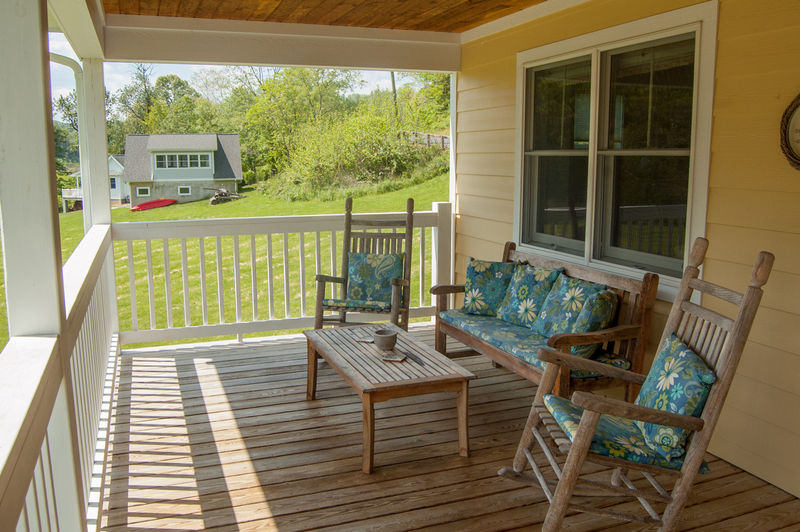 Plenty of space to spread out inside and out- the back porch is a perfect place to relax and enjoy the view and breeze. A lovely home with everything you need to have a short or long stay. Would definitely stay here again!" "Overall good experience. 2nd year we've not received key lock code via email and have had to contact the office." 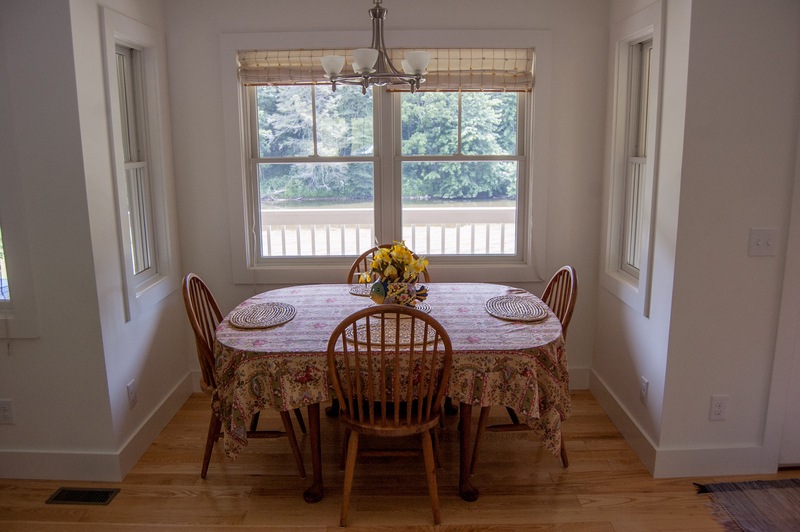 "The cottage was clean, neat, very nicely decorated, and quite functional. The manager (Sanford) was polite and helpful. Back porch overlooked the New River and was dog friendly, with a gate that closed." "Very nice place. Decorated very tastefully, cute as my wife said. Nice views. Fishing is not good in the stretch of river on property. River access to good fishing spots hard to find. Tubing etc...great. 15 min to Jefferson / W Jeff. Will be back, probably several times. " 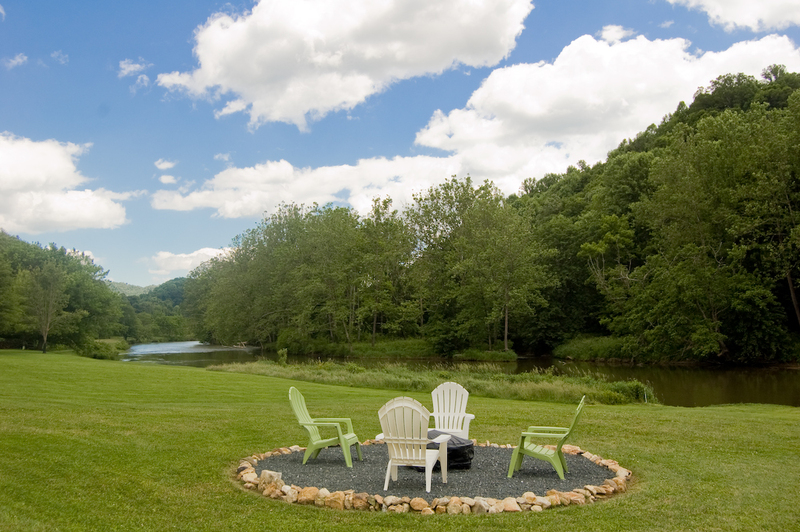 "As always, I had a wonderful week at Dove Cottage II, right on the New River. Everything was spotless and just perfect for myself and my daughter, over visiting from England. Quiet and peaceful yet VERY easy access to town, this is the High Country at its best. We used to live in Ashe and I keep coming back - highly recommended! Jerrita & co are the friendliest and most efficient you could ask for.vv "
"The home was actually nicer than the pictures indicated. The inside was immaculate (even by my wife's standard).The only improvement to the rental would be a load of river rock added to allow access. " "Our 6 nights were wonderful at the Dove Cottage. We fished, kayaked, walked, and explored the river. We loved the openness and cleanliness of the cottage and the front porch was amazing. I' m assuming with the recent rains, the grass wasn't able to be mowed, but other than that, it was wonderful. " 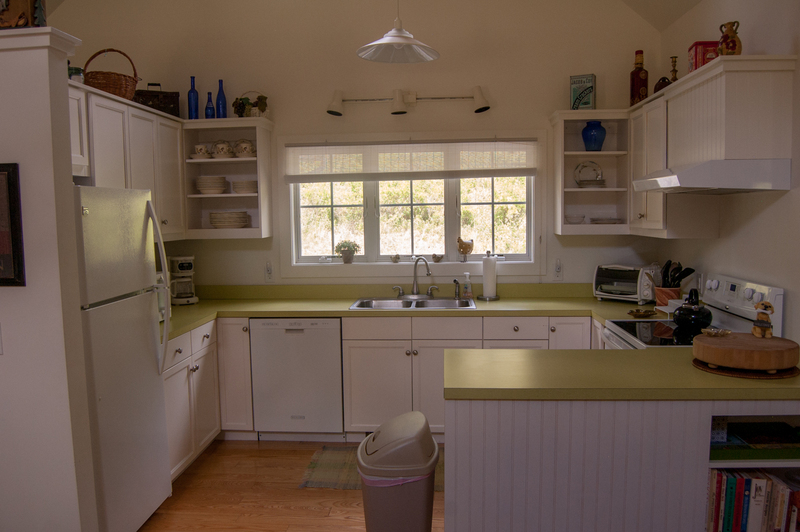 "Dove Cottage II exceeded my expectations, as far as cleanliness and providing everything we needed. This one was of the best rentals I've ever stayed in. It was well-stocked throughout, from the kitchen to the bathroom. And, it was so quiet & peaceful, just what we were looking for. It was neat to watch the kayakers float by and we even saw a bald eagle perched across the river. The back porch was one of my favorite features. I can't wait to go back." "Once again, Dove Cottage was a wonderful blessing! It is always so immaculately clean and welcoming. It's close to town with the Arts Council Gallery, Cheese Factory and shops, and, yes, there are neighbors but they never intrude on the peace & quiet. The back porch is a touch of heaven, with the beauty of the river and the woods to greet you every morning. Judy and Jerrita were, as always, outstanding in their service and assistance. Thank you so much to the owners that my dog Grace is able to have a mountain retreat too - the welcoming biscuits for her were such a lovely touch! My only hesitation in wholeheartedly recommending this beautiful cottage is that I'm afraid it might be booked up for when I can get away to there again! :-) "
"I love this place! I have stayed here several times and enjoy it each time. Very quiet and peaceful location. The house is always spotless! The only issue is that there is no access to water in front of the house for rafting or swimming. Of course, there are rentals just a few miles away, but misleading to say there is swimming and rafting available on the property. " "This rental is amazing! Clean, beautifully decorated and in a gorgeous location. " "Our family had a great Memorial Day weekend at Dove Cottage. The house was beautiful, clean, and well stocked. The New River access was awesome and the yard was perfect for the kids to play. The only complaint is the driveway is challenging to access, especially pulling a trailer full of kayaks." 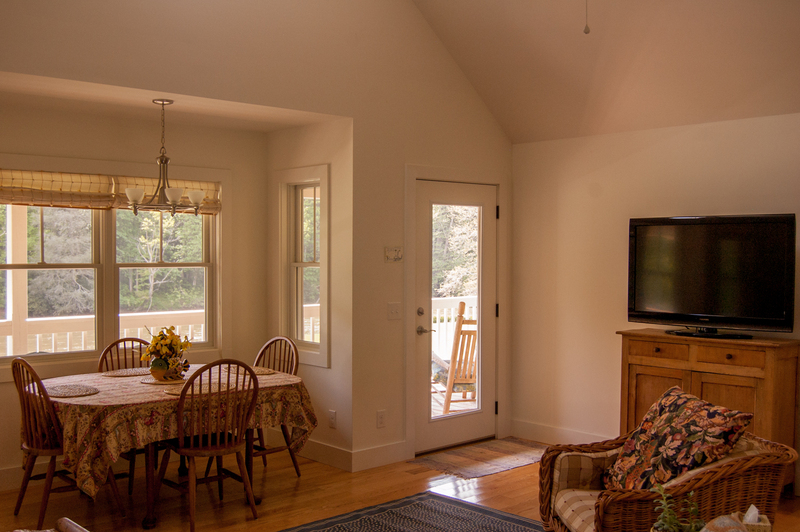 "What a beautiful,exceedingly comfortable cottage in an outstandingly beautiful setting! Lots of level ground for our dog to play and to enjoy the river and birdlife. Perhaps a few little items we would have liked in the kitchen (better can opener, colander that wouldn't lose your spaghetti down the sink, for instance), but everything was spotlessly clean and easy to find. The location is easy to find and good roads to town. Many thanks to Jerrita for her excellent help - a 5-star stay! We would DEFINITELY stay here again!!! " 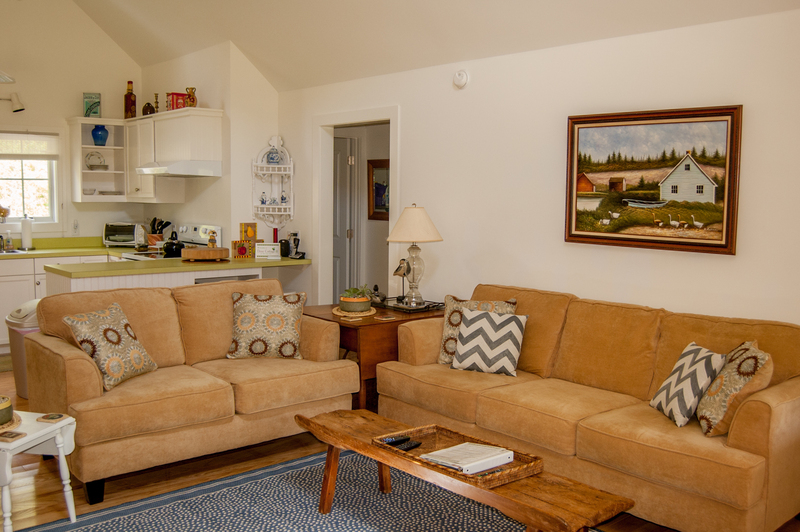 "The Dove Cottage II is so charming! The house was immaculate, tastefully decorated, very well taken care of, and supplied with everything we needed. We have rented many cabins/vacation homes in the past, but this particular home rates above the rest due to all the details the owner has included. We loved this cottage!!! " "What a wonderful stay! My mom, husband and myself were staying for a short weekend. The house was set up exactly for what we needed and was extremely clean and decorated with great antiques! This is would also be good for two couples. Although too cold for being on the river when we were there, I would love to go back when we can get out on the river and spend time in the large yard setting by the firepit roasting marshmallows! Thanks for providing a nice stay!!!" "Scenic and peaceful location. Visited the Ashe county farmer's market and downtown Jefferson while we were in town for a wedding. Had a great time!" "This is a great property in a great location, I would stay again. Property Mgr. and Owners were very attentive to any needs. There are a couple of things that could make this 10 stars. 4 rocking chairs on the deck and more comfortable living room furniture. Highly Recommend." "We spent Labor Day weekend here and are already ready to go back! The house is clean, well maintained and has all the amenities we needed for a relaxing long weekend of tubing and cooking out. Grocery store and Walmart not too far away and, Shatley spring just down the road. The beds are super soft which was fine for me but the others said they didn't sleep well. They supply all the linens, towels and cleaning supplies needed. It was also nice being able to bring the dog! " "As always we loved our stay at the little house by the river. This time we saw Osprey fishing in the river from the back porch! How cool is that? In our travels off the Blue Ridge we say wild turkey with their babies. We love this clean sweet home to come home to!" "The house was great and yard was awesome. It was very clean and quiet. " "Our weekend anniversary celebration was perfect! From booking with Judy through Ashe High Country Vacation who provided the best customer service to the wonderful neighbors we came into contact with providing us access for kayak put in and tips for fishing. We kayaked, fished from the banks, experienced wonderful wildlife, and the cozy, beautiful home made want to return soon. While the home had all of the amenities you need to never leave, we chose to eat at Shatley Springs (great country cooking) for our meals and take the weekend off from working. We also enjoyed a quick visit just down the road in Jefferson where we went to Ashe County Cheese Factory and many wonderful shops with local artists and antiques. Thank you to the Owner for providing such a fabulous vacation option and Ashe High Country Vacations. We will be back and we're sending friends to you!" "lovely place and ver relaxing!" "This cozy cottage was just what we needed for a Valentine's weekend. It was exceptionally clean and wonderfully decorated as well as well stocked with everything we needed. Beds were comfortable, linens and towels were high quality. The weather turned windy,cold and snowy yet this cottage was solid, warm and wonderful. It is a quick drive into West Jefferson. We highly recommend the Cheese Factory cheeses. Lunch at the Hill Billy should not be missed if you are looking for a yummy soup and sandwich place. We can't wait to book another stay at the Dove Cottage II!!!!" "My wife and I have been able to enjoy the Jefferson/West Jefferson area over the last 2 years and this new location did not disappoint us. While it was not as secluded as the other cabins we have stayed in, it was very quiet and relaxing! We enjoy getting to know the area around Ashe County. The cottage was really neat and we both liked the layout. Great open plan to enjoy the view of the river! My wife enjoyed the reading nook in the master bedroom and we both enjoyed the day bed in the sitting room/den. The cottage was easy to find after a little clarification between Hwy 16 and "Old Hwy 16". I'd give the cottage 5 out of 5 stars, and the location 4 out of 5 stars. " "We spent four days in mid October at the Dove Cottage II with our dog. We had to dodge quite a bit of rain. Nevertheless, we had a very fine time. The cottage was near the hiking we managed to squeeze in. The back porch was perfect, as it was well protected from the weather and with a great view of the river. The cottage, itself, was comfortable and cozy (in the rain). The location was midway between West Jefferson and Grayson Highlands State Park, which was perfect for us. We look forward to staying there again. " "We stayed here last year, so it was an easy choice to stay here again, only we stayed longer this visit. A clean and well maintained rental. Will stay again! Thanks!" 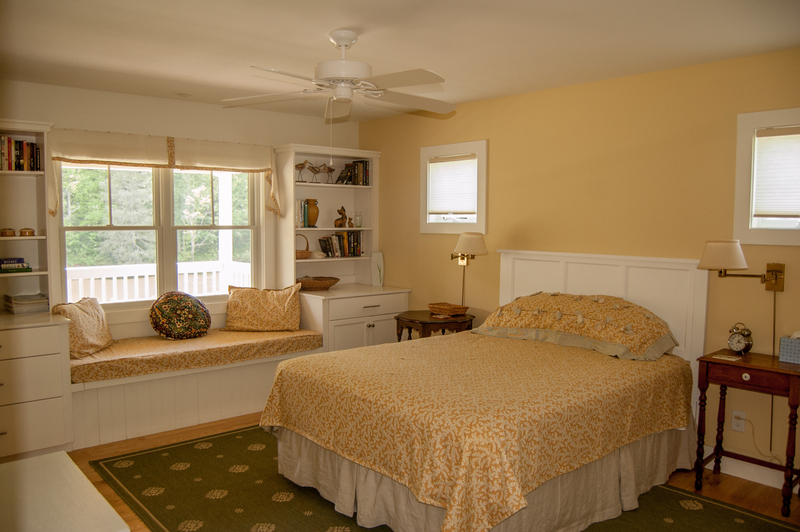 "Dove Cottage was even more beautiful than the photos--beautifully decorated and well equipped. The location is perfect-far enough away from town to be totally serene and relaxing, but close enough to shop, sight see, or dine out. We enjoyed a roaring fire in the fire pit, since the evenings were cool. Of course, we had s'mores. The huge deck was great for relaxing and enjoying the river and the brillant color of the fall leaves. Hope to return next year!! We highly recommend Dove Cottage!!" "IT WAS A BEAUTIFUL PLACE,NICELY DECORATED.I REQUESTED A RIVER RUN BESIDE IT.THE VIEW WAS NICE,HOWEVER I SHOULD HAVE REQUESTED FISH BE IN IT." "The cottage style decorations made this a perfect place for a "girls weekend" with my mom. We had everything we needed. The house was SPOTLESS when we arrived! It was a great location for us because of the close proximity to Riverside Canoe & Tubing rentals. (Approx 6 m). I would definitely stay here again!!" "Ended up here when our B & B cancelled and we were lucky enough to get a cancellation ourselves. Two bedroom, two bath cottage with all the amenities. Large, comfortable rooms all with views of the river. Grill, fire pit, big deck made for a comfortable stay no matter what the season. A little isolated but still a good location especially if you want to be by the water. Would return if in the area." "Enjoyed our stay at this cozy cottage. So charming and just enough room for the four of us." "We had a fantastic time on our vacation. This was a wonderful cabin-very peaceful and relaxing. We were able to cook our meals in the fully furnished open-area kitchen, and enjoyed roasting marshmallows at night by the fire pit. The location was near Jefferson and West Jefferson, and we even took a scenic trip to Virginia. The layout of the house was perfect for our family of 3, or for 2 couples. We would definitely stay here again!!!" "The house and location were very nice. However, if you are use to renting properties with electronic amenities this is not the house for you. It would have been nice to have a radio and a few more options on the TV." This is one of our get away from it all rentals. Perfect river location and a perfect place to unplug! "Our family of four was looking for a place to get away for a few days before the chaos of the school year, and this was a perfect location. We tubed down the river, kayaked from a nearby outfitter, and did a LOT of deck sitting. Perfect size for a family of four (two were teenagers)"
"This cottage was impeccable; we really enjoyed the openness, windows, etc. I noted some previous occupants had written about popping sounds, probably from the new flooring - this did not occur while we were there. I'd recommend this to friends & will stay again!" "Everything was good except for some banging noise at night only which made it difficult to sleep for all of us. The place needs a sign it was difficult to find." definetly will be going back to this place.We went canoeing two days and very close to canoeing rentals. Loved it!!!!!!!!!" "We rented this house on short notice and couldn't have been luckier. The location is a bit of a drive from Boone, but pretty close to West Jefferson. 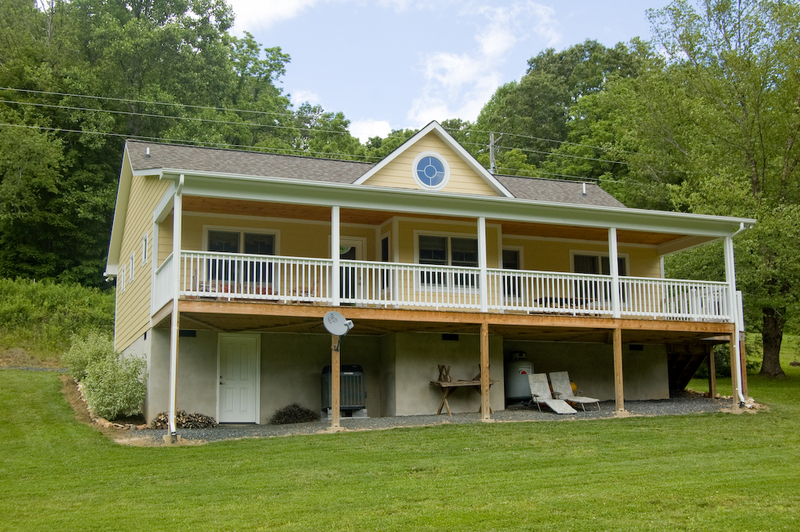 The house is right on the New River and the owners provide some high quality tubes to play in the river. You can also walk upstream from the house on a little road and hop in the river a little over a mile from the house and float back to the house. All-in-all, this was a great place to stay and one we will definitely come back to." "The only complaints we had were the following: livng rm. couch & chairs were not very comfortable or functional; mattress in master bedrm. was too soft." 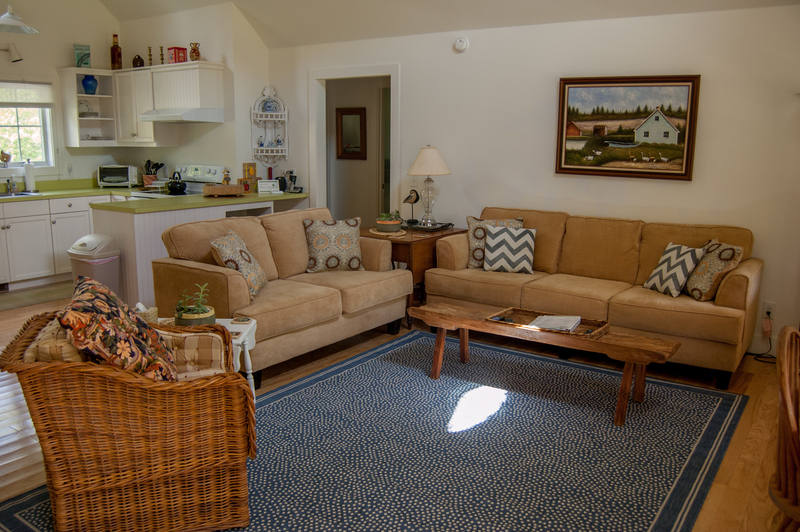 "Our stay at Dove Cottage could not have been better. It was clean and cute as can be. We were in the river daily so the 4 tubes were perfect. We brought our own kayak and bikes. Just up the road was a great place to put in. We love the Jefferson area and didn't feel that Crumbler was too far off the beaten path for our exploring. We can't wait till we can come again. I already miss waiting up to the beauty and peacefulness of the river. BIG THUMBS UP!" "Just perfect. I definitely would stay here again. " "This is a beautiful house that is very nicely decorated. If you want a get away and are not concerned with being close to a city for your entertainment, then this is the perfect place. "